Presents over 100 sets of questions, or different lenses, for viewing a game’s design. 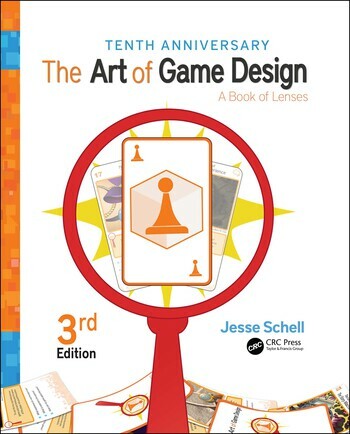 Written by one of the world's top game designers, this book describes the deepest and most fundamental principles of game design, demonstrating how tactics used in board, card, and athletic games also work in video games. It provides practical instruction on creating world-class games that will be played again and again. New to this edition: many great examples from new VR and AR platforms as well as examples from modern games such as Uncharted 4 and The Last of Us, Free to Play games, hybrid games, transformational games, and more. Ch 1 In the Beginning, There Is the Designer. Ch 2 The Designer Creates an Experience. Ch 3 The Experience Takes Place in a Venue. Ch 4 The Experience Rises Out of a Game. Ch 5 The Game Consists of Elements. Ch 6 Ch 7 The Elements Support a Theme. Ch 8 The Game Begins with an Idea. Ch 9 The Game Improves through Iteration. Ch 10 The Game Is Made for a Player. Ch 11 The Experience Is in the Player’s Mind. Ch 12 The Player’s Mind Is Driven by the Player’s Motivation. Ch 13 Some Elements Are Game Mechanics. Ch 14 Game Mechanics Must Be in Balance. Ch 15 Game Mechanics Support Puzzles. Ch 16 Players Play Games through an Interface. Ch 17 Experiences Can Be Judged by Their Interest Curves. Ch 18 One Kind of Experience Is the Story. Ch 19 Story and Game Structures Can Be Artfully Merged with Indirect Control. Ch 20 Stories and Games Take Place in Worlds. Ch 21 Worlds Contain Characters. Ch 22 Worlds Contain Spaces. Ch 23 The Look and Feel of a World Is Defined by Its Aesthetics. Ch 24 Some Games Are Played with Other Players. Ch 25 Other Players Sometimes Form Communities. Ch 26 The Designer Usually Works with a Team. Ch 27 The Team Sometimes Communicates through Documents. Ch 28 Good Games Are Created through Playtesting. Ch 29 The Team Builds a Game with Technology. Ch 30 Your Game Will Probably Have a Client. Ch 31 The Designer Gives the Client a Pitch. Ch 32 The Designer and Client Want the Game to Make a Profit. Games Ch 33 Transform Their Players. Designers Have Certain Responsibilities. Ch 34 Each Designer Has a Purpose. Jesse Schell is professor of entertainment technology for Carnegie Mellon University's Entertainment Technology Center (ETC), a joint master's program between Carnegie Mellon's College of Fine Arts and School of Computer Science, where he teaches game design and leads several research projects. He is also CEO of Schell Games, LLC, an independent game studio in Pittsburgh. Formerly he was creative director of the Walt Disney Imagineering Virtual Reality Studio and chairman of the International Game Developers Association (IGDA). Schell worked as a designer, programmer, and manager on several projects for Disney theme parks and DisneyQuest. He received his undergraduate degree from Rensselaer Polytechnic Institute and master's degree in information networking from Carnegie Mellon. In 2004, he was named as one of the World's 100 Top Young Innovators by MIT's Technology Review.